The advent of digital media, distance-collapsing technologies, and various new formats of intercultural communications — from messaging apps to memes — has transformed nationalism. In this keynote address, Professor Robert A. Saunders will interrogate the ways in which the internet serves a tool for mobilization, transnational engagement, and national identification in the twenty-first century. Drawing on his seminal text Ethnopolitics in Cyberspace: The Internet, Minority Nationalism, and the Web of Identity, his talk will examine the tectonic shifts that have occurred in the decade since its original publication. 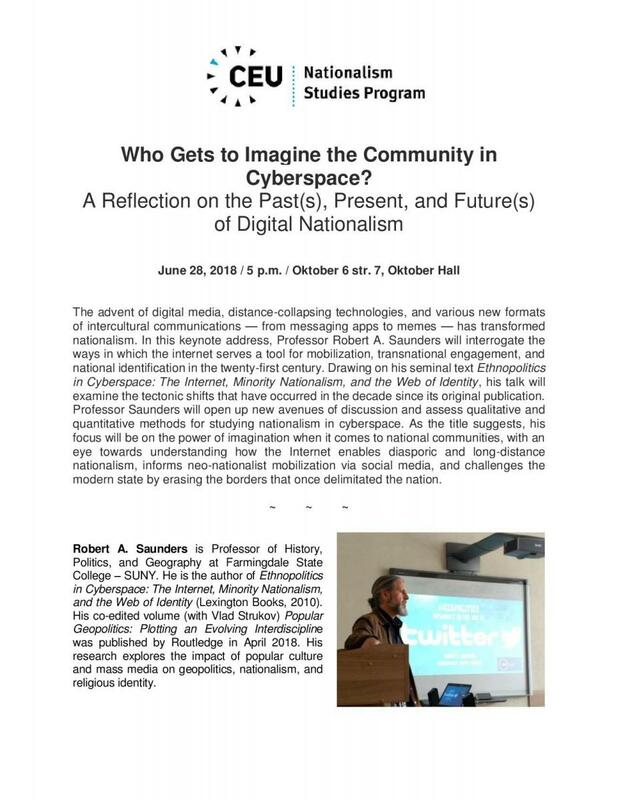 Professor Saunders will open up new avenues of discussion and assess qualitative and quantitative methods for studying nationalism in cyberspace. As the title suggests, his focus will be on the power of imagination when it comes to national communities, with an eye towards understanding how the Internet enables diasporic and long-distance nationalism, informs neo-nationalist mobilization via social media, and challenges the modern state by erasing the borders that once delimitated the nation.